A Healthier Me...Simple & Clean | "Living life to it's fullest with clean eating, farm living, Christianity, simple recipes, and great books!" I’m not sure if it’s just me or what, but I feel like we are going to have an early fall here in the mountains of Kentucky. The evenings are becoming cooler and my canning is once again filling the pantry. As our summer yellow squash and zucchini are producing their final blooms and the freezer is well stocked with both, I began to feel creative. I wanted to try something new with the squash and zucchini. I wanted to try something other than sautéed squash and zucchini, dried zucchini, zoodles, pickled squash and zucchini and all the other creative and delicious dishes that my family enjoys each summer. I had wanted to try using our delicious summer squash in a tasty soup. After a couple of attempts, and a few alterations…we enjoyed a delicious and very satisfying summer squash soup! I am very excited to share my delicious clean summer squash soup recipe with each of you. This soup has quickly become a favorite of my entire family, even my mom! Heat one tablespoon of extra virgin olive oil in a 4 quart cooker add diced onion, diced red pepper, minced garlic, and saute until the onions and peppers become tender. Add salt, pepper, rosemary, and paprika, stir and simmer for 1 to 2 minutes. Add sliced mushrooms. You may need to add more olive oil once the mushrooms absorb the oil in the cooker. Only simmer for about two minutes, or until the mushrooms change color. Add tomatoes and the entire box of vegetable broth. Reduce heat to a simmer. Cut zucchini and squash into cubes. I like to cut mine into about one inch sections. I slice the squash and zucchini and then cut the slices into wedges (similar to cutting a pie) this allows each piece to maintain some of the peel, which is important for texture. Add squash and zucchini and stir. Drain and rinse beans and add to the soup. Add frozen peas and corn. You may season with additional salt and pepper to meet your own taste preference. Add dried parsley flakes and cover. Allow to simmer at a very low temperature for twenty minutes. Remove from heat and serve. I have tried this recipe both with corn and without corn. My mom and I both agree that it’s best with corn. I also use fresh ears of corn cut off the cob. You may make changes to the recipe to meet you and your families needs. I hope that you and your family enjoy this savory and very easy recipe as much as my family has. You may follow my blog by adding your email and clicking on the follow button at the bottom of the page. Also, feel free to comment on my post. I love to hear from my readers. Blessings to you and your family from our family in the mountains of Kentucky. Be sure to check back or to follow my blog for upcoming recipes, book reviews, clean eating tips, eating and living a healthy lifestyle, inspiring and uplifting articles, farm life, and what it’s like living in the Appalachian Mountains of Kentucky. Mexican and Italian foods are my absolute favorite. I actually think I could eat a taco salad or spaghetti every night for supper and be happy. Just because I am eating cleaner and healthier doesn’t mean that I have to sacrifice taste or Mexican or even Italian food. It just means that I cook…a bit more creative and a lot more healthy! I discovered recently that I love acorn squash. I love it so much, that I decided I would dry the seeds to plant and grow my own! I’ll let you know how our attempt at growing our own deliciousness turns out this fall when we harvest them. Cut the squash in half lengthwise. Clean out the seeds and stringy middle of the squash. Drizzle olive oil over the squash to prevent the squash from becoming too dry during the baking. Sprinkle with salt, or no salt if you are watching your sodium, black pepper and paprika. If you are baking in the oven, pre-heat oven to 350 and gently spray pan with cooking spray or line with parchment paper and place the squash inside down on the pan and bake 45 minutes or until tender when a fork is inserted. If you choose to bake your squash in the microwave, follow the same process above when seasoning and place inside face up and bake for five minutes and check to ensure the squash is tender. Remember microwaves vary in cooking time. If the inside of the squash is not tender, bake for an additional five minutes. When I microwave acorn squash, I typically bake it for ten minutes. Clean the seeds with a spoon. Drizzle with extra virgin olive oil and salt and pepper. Two tablespoons of refried beans (you may also add rice of your choice, I’ve made it both ways. Love adding a tablespoon or two of leftover rice) you may also substitute with black beans this can be your own preference. While the squash is baking you will need to prepare meat, unless you are using leftover meat that only needs warming. Set aside and spray a large frying pan with cooking spray and add a tablespoon of extra virgin olive oil. Heat pan, but don’t over heat. Add diced onion and peppers and a sprinkle of pepper and salt. Stir and cook but don’t allow them to caramelize. Add sliced or diced zucchini and squash and sauté until nearly tender, but still has a bit of a bite. Sprinkle with salt, pepper, paprika, cumin, and add sliced portobello mushrooms and meat. If your meat is dry, such as chicken, you may need to add a little extra virgin olive oil as the mixture simmers due to the mushrooms soaking up the moisture. Once the mushrooms become tender add the diced tomatoes and taco seasoning and baby spinach. Allow to simmer at a low heat for eight to ten minutes and remove from the heat. You do not want the zucchini and squash to be overdone. Remove the squash and allow to cool for about three to five minutes. You may use a fork to shred the inside of the squash or leave it in tact. I enjoy leaving it and taking bites of more chunky squash while I’m eating. Spread the refried beans over the inside of the squash (I have used leftover baked butternut squash as a bean substitute…it was an awesome twist) After spreading the beans over the squash spoon the delicious filling that you sautéed into the acorn boats and top with diced avocado, shredded cheese, salsa, and sour cream. All that’s left to do is to enjoy!! Acorn squash chicken taco boat with vegan provolone cheese! Delicious! I hope you enjoy this delicious twist on the traditional taco salad as much as I have. Keep in mind that you can alter the recipe to fit your dietary needs, taste preferences, and or alter and make the recipe a recipe of your own. This is a great dish to clean out those leftovers that have a way of consuming our fridge. I enjoy shredding baked chicken breast for this dish as well as shredded baked turkey, and have used that leftover chicken burger or turkey burger as well. I have used shredded steak, and even used turkey sausage. That’s just one of the joys of cooking…creating a dish to be exactly what your palate is craving! You may also mint the meat for a delicious vegetarian meal. The possibilities are unlimited. If you like my take on Acorn Taco Boats, you will enjoy my twist on a Clean Spaghetti Boat. I hope you enjoy my Acorn Squash Taco Boat. Please feel free to leave comments, or ask questions. I love hearing from my readers. Be sure to visit A Healthier Me Simple and Clean in upcoming days. I will be adding new recipes, canning recipes and tips, a book recommendation, and also an inspiring post that will motivate you to eat clean and enjoy the simple things in life. From the mountains of Kentucky, God bless each of you and thank you for stopping by my little corner of the world. With each breath we take we experience a grand opportunity. We are given the grand opportunity to experience life to the fullest. It’s up to us whether we allow negative circumstances to impede and rob of us of our joy, zeal for happiness, creativity, faith, our day at hand, and our days ahead. We have the choice to either get up and live…or sit idle and watch life pass us by. After receiving a less than desirable report from my doctor several years ago I decided that I had let enough time pass me by. I was tired of sitting idle on the outskirts of life and literally watching it pass me by. I was tired of feeling tired all of the time, lacking energy, waking with aching bones, tired of being overweight, and tired of taking medications that could have serious side-effects. I wanted to feel good and be healthy. I wanted to live, and I wanted to live life to its fullest. I began my journey to live a healthier life, a more simple life, a clean life of eating more abundantly from the earth than consuming man-made processed foods. I became more dedicated to myself, my well-being, my faith, and also to my future through making better choices about what I consumed, relaxing more, exercising more, and removing myself from negative situations and negative people. Slowly, one step at a time, one day at a time…my life began to turn around. The weight began to dissipate, my energy level increased, my outlook on life became more positive, my vitality began to emerge from a place where it had lurked deep in the mires of captivity within myself for far too long. God’s beauty abounds in the mountains of Kentucky. Fast forward eight years and I am now 77 pounds lighter and only ten pounds from my goal weight. I am actually wearing sizes and styles of clothes that I never thought I would wear again. I no longer shop in the plus size clothing department. My stamina has returned to an amazing level of satisfaction, I am no longer taking diabetic medication, one less cholesterol pill, and I no longer take stomach medicine. I am sleeping better at night, rising earlier in the morning with more energy. I am enjoying working longer hours in our vegetable garden, and also enjoying every minute of life to the fullest. With this zest for life also came challenges, both negative and positive. Our world was forever changed by the horrifying word, cancer. My husband was diagnosed with stage two cancer one year ago this month. However, God is good and His grace is abundant. My husband returned to the doctor for a six month check up just last week and was given a clean bill of health. It was a journey…a rough and scary journey along the way, but a journey that was also filled with many life lessons. We were reminded to take each day one day at a time, breath deeply, don’t look back and say what if, remain positive, seek God’s guidance in all things and all decisions, and just keep walking and breathing life’s precious joys both big and small. On a more positive note, just before my husband received his diagnosis, I signed a contract to write a text-book for two courses that I teach. It was a scary moment to sign the contract stating that I could have the nearly four page text written within the year, but I decided that I would not allow this opportunity to pass me by. With my signed contract also came excitement, dreams, fears, joys, worries, and rigorous deadlines. I wrote with a fire and passion about what I wanted to teach my students…I was motivated! Writing the textbook was also a journey. A journey of early mornings, late nights, revisions, proofreading, researching, writing, praying, re-writing, praying some more, decisions, predictions, and many long hours sitting at my desk with a blank page opened on the computer awaiting to be filled with inspiring research-based information of how to teach reading and language arts. One day at a time, one page at a time the pages begin to fill and the final submission was emailed to the editor only a couple of weeks ago. I am excited to receive my copies in upcoming weeks, but also excited to have time to blog again!! Today, I find myself reflecting on the past with gratitude. I am thankful for my husband’s health, the incredible opportunity and experience of writing a textbook that I can use to guide and teach my students the process of teaching reading and writing as I once taught it with passion as an elementary teacher. I am thankful for the bountiful garden that He has blessed us with, our family and our health, and the joys of life. I am thankful for the breath that I take. I know that each breath I inhale is an opportunity to experience the wonderful joys of living another day on God’s precious earth simple and clean, yet full of passion and daily opportunities that I want to cease. Don’t let time pass you by without getting up and living. Life is compared to a vapor on water…it passes very quickly. Remember, slow down and take the time to enjoy the small things in life, vibrant blooming flowers, majestic oceans, serene sunsets, fabulous sunrises, and enjoy and cherish moments with family. Engulf yourself with positive thoughts and surround yourself with positive people. Embrace opportunities to improve yourself, your health, your peace of mind, and above all your spiritual self. Feel free to leave comments. Also, check back in upcoming days. I will be posting a delicious acorn squash taco salad very soon that I am sure you will love! Fall is my favorite time of the year! The mountains of Kentucky are visually stunning this time of year! The brilliant colors of the leaves are gorgeous! While puttering around the house and making plans for fall break this weekend my thoughts turned to the joys of holiday baking. I wanted to create a new fall dessert…I wanted to create a new clean pumpkin treat that was more than a pumpkin treat. I wanted to create a delicous clean treat! While scouring the pantry for ingredients I stumbled upon inspiration. I love when that happens! The unthinkable ingredient just kind of jumps out at you and your original plan takes a total 360! That’s when inspiration truly takes over and an inspired recipe begins to unfold and come together! With that being said, I am super excited to share with you my latest recipe for clean fig pumpkin bars. If you like fig cookies and pumpkin pie…I am confident you will enjoy my fig pumpkin bars! Are you ready? Let’s get started! Preheat oven to 350 degrees. Ovens will vary, but my best bars worked at 350. Combine the dry ingredients for the crust one at a time and add to either a food processor or a ninja. I used my ninja and it worked out great. Once you’ve added the ingredients you will need to pulse slowly until the mixture is chopped well. Add water and honey a little at a time until the crust comes together. You will know your crust is ready to press in the pan when it forms a ball and stays together. Spray a 8 X 8 glass pan with cooking spray and press crust mixture evenly into the pan and set aside. For the filling you will need to whisk the eggs in a large bowl, add the pumpkin and mix thoroughly. Add softened oil, or butter to the mixture. Add wet ingredients one at a time mixing with each additional ingredient. Add dry ingredients and mix well. Whisk until the filling is fluffy. Pour pie filling over the crust and smooth out. Tap gently on the counter top to remove any air bubbles and then bake in the preheated oven for an hour. Check your pumpkin bars for doneness by inserting a toothpick. When the toothpick comes out clean your pumpkin bars are ready. You can add a sprinkle of chopped nuts for a little extra crunch. Allow them to cool completely before cutting. I like to allow mine to cool for about thirty minutes on a wire rack and then place in the refrigerator for an additional thirty minutes before cutting. Once the bars are cooled you are ready to enjoy! The bars will keep refrigerated for up to two weeks, but trust me they won’t stay around that long! I hope you and your family enjoy my spin on a tradition pumpkin pie for a sweet and clean holiday treat or any day treat! Feel free to leave feedback. I love to hear from my readers. I would like to hear how you enjoyed this sweet treat. Did you try it with a whipped topping, for an afternoon treat with coffee or for your fall festivities? From the mountains of Kentucky…happy fall y’all! Each bar is approximately; 75 calories, with 6 g fat and 2g saturated fat, 17 carbs, 24mg cholesterol, 3g protein, and 4g dietary fiber and 46 mg sodium. Canning Tomato Juice the Easy Way! It’s hard to believe that fall is upon us! While walking Freckles this morning I noticed the colors of the leaves. The subtle changes that are already taking place are beautiful, which make me anxious for all of the fall festivities, foods, colors, fashion and every part of fall except knowing that winter follows these wonderful months. Dreading the snow and ice of winter is a natural part of living in the heart of the Appalachian Mountains…but I can honestly say, there’s no place like home and I can’t imagine living anywhere but the mountains of Kentucky. With the happy thoughts of fall also came a bit of sadness. As we walked past our garden a mix of emotions consumed me. We’ve been very blessed with a bounty of delicious vegetables this year. But, seeing the final tomatoes of the season struggling to cling to the dying vines, the bean vines turning yellow and the corn stalks anxiously awaiting becoming decorative fodder shocks…a bit of sadness consumed me and filled my heart. I knew that I would miss visiting our garden and picking vegetables each evening. I would even miss hoeing the rows of ripe delicious vegetables, all the hours of hard work…but then thinking about the abundance of canned food our garden has provided somehow made the upcoming days of winter a little less undesirable. Suddenly, I had an overwhelming urge to cook a bit stock pot of homemade vegetable soup! With the last days of summer approaching also comes the time to can tomato juice. My family loves tomato juice in homemade vegetable soup, chili, macaroni and tomato juice and sometimes just as a wonderful and tasty juice to drink. Anyway homemade tomato juice is incorporated…it’s delicious and always makes the dish a bit tastier! When I first began canning for myself and my family. I was eager to incorporate skills I learned as a child growing up in a farming community and also experiment and create strategies of my own to discover my own style. I was eager to make it mine, to know it and to own it! Over the years I have learned many new tricks, strategies, and ideas that have made canning much more pleasurable and shortcuts that also helps canning fit into my busy schedule. As a college professor, writer, wife, mother and grandmother my schedule can fill up very quickly, as I’m sure yours does as well. I also wanted to find methods to can healthier food to accommodate my style of clean eating. I’m anxious to share my quick and easy method of canning delicious time-tested tomato juice with you so that you can also preserve your own delicious jars of tomato juice for you and your family. Wash and sterilize jars, rings and flats. Add a tablespoon of lemon juice and one-quarter teaspoon of salt in each quart jar and set aside. Wash tomatoes, cut the core and any bruised or bad spot out of the tomatoes. There’s no need to peel the tomatoes. Cut tomatoes into quarters and place in the ninja or blender. Using the ninja I pulse several times and then process the tomatoes for a couple of minutes, usually only two minutes or so, just until they become a thick tomato puree. Pour the puree into the large stockpot. Once all of the tomatoes have been processed through the ninja and poured into the stockpot turn the burner on and slowly bring to a boil. Once the tomato puree is boiling begin stirring and allow tomatoes to boil five minutes stirring constantly. After five minutes turn the burner off and remove tomatoes from heat. Place the funnel in the mouth of the quart jar. Holding the strainer or sieve over the funnel begin adding the tomato puree into the strainer. You may use a ladle to add the tomatoes to the strainer. Using the wooden spoon press all of the tomato mixture through the strainer and through the funnel filling the jar with beautiful tomato juice. Once the jar is full with at least a half-inch head space remaining wipe the rim of the jar and place the sterilized flat and ring on the jar. You can then clean your strainer out. You will notice that there’s not much left in the strainer, but you will find seeds and a little tomato peel remaining. The great news is there are little to no seeds in your juice! Yay! Continue filling the jars by pressing the tomatoes through the strainer and into the jars. Once you’ve filled the jars (usually a 3-5 gallon bucket of tomatoes makes at least 7 quart jars of juice) place jars in the canner with water covering the jars by at least an inch. Slowly bring water to a boil. Once the water begins to boil process the jars of juice for twenty minutes. After twenty minutes turn the stove off and allow the water to settle and slightly cool. Carefully remove jars from the canner and place on a towel or cooling rack. You should hear that wonderful popping sound that we all enjoy hearing so much! The jars should begin to seal right away. Once they’ve sealed and cooled you are ready to add the dates on the lids with a permanent marker and add the beautiful jars of red deliciousness to your pantry shelves! I have learned that canning a few jars of juice at a time prevents me from getting burn out and becoming overly exhausted with making tomato juice. I have also found that I still gain as many jars of juice over a period of weeks or possibly two months as I do when I have tried to juice bushels of tomatoes at one time. I like juicing in increments as I can involve my grandchildren and allow them to learn the process of canning and gaining a cultural experience and learn a tradition that many have already forgotten. I love passing down cultural experiences from generation to generation. I hope that you enjoy my method of canning tomato juice as much we do and find as much pleasure in the dishes that you create with this tasty deliciousness. Be sure to check out Canning Green Beans the Time-Tested Way for another time-tested method of preserving your beautiful bountiful vegetables. If you’ve enjoyed my recipes or articles, please feel free to leave a comment. I truly enjoy hearing from my readers. Also, thank you for your continued support. For now, blessings from the mountains of Kentucky! I love quiet mornings in the Appalachian Mountains. With the house filled with the aroma of brewed coffee and the roosters crowing their good morning wake up call I am filled with enjoyment, peace and the security of home. I’ve always believed in that all too familiar cliche…”there’s no place like home”…even when home is buzzing with activity. Activity is actually an understatement. It’s been a very hectic week around our home. My kitchen is still buzzing with action as we plan, prepare and fill our pantry and freezer with healthy garden food for the upcoming winter months. As our garden flourishes our table continues to be filled with family, memories, conversation and wonderful healthy dishes. We’re also still enjoying the process of canning, dehydrating and freezing for upcoming winter months. It’s a comforting feeling and a feeling of accomplishment to know that our family will be enjoying green beans, okra, corn, apples and many more delicious homegrown treats from our garden including summer squash and zucchini. Yes, those big bountiful plants are still producing an impressive amount of deliciousness daily! We have been blessed with enough of both vegetables to enjoy daily and to also preserve for our family, our families family, our church family and our neighbors! God has truly blessed our garden with a bountiful harvest this year! In my last blog post I shared twelve ideas of how to enjoy all those summer squash and zucchini that you’ve grown. I hope you stepped outside of the traditional banana bread and baked as well as enjoyed the tropical pomegranate bread made with summer squash! I’ll be honest…we’ve enjoyed a couple more loaves since I posted the recipe. It has quickly become a new family favorite. When you bake don’t forget to vacuum seal a few extra slices for that warm winter evening snack, or anytime snack! If you’ve not checked out this delicious recipe…don’t hesitate…check it out! What are you waiting for? You’ll love it! Tropical Squash & Pomegranate Bread/Muffins For your convenience, just simply click on the link above and introduce your family to my families new favorite! 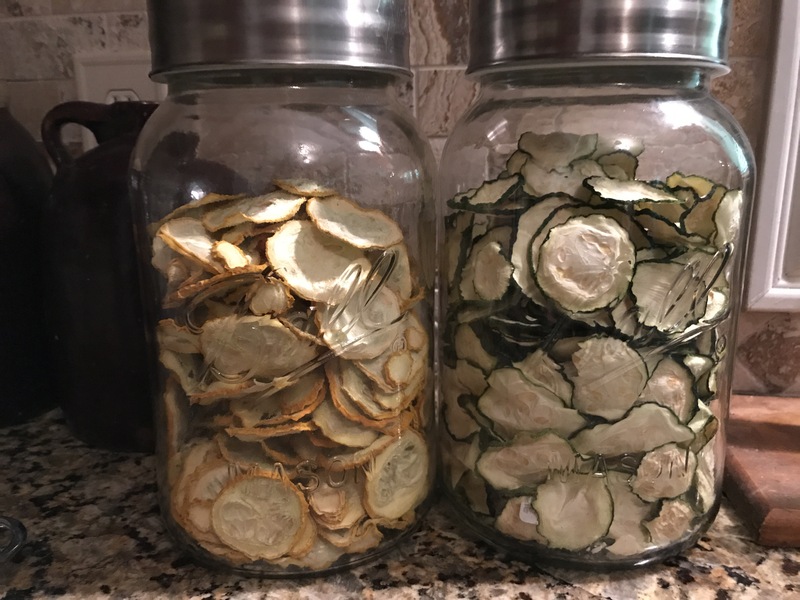 With the freezers beginning to fill up and the canning shelves being carefully lined with a multitude of goodies, I decided it was time to crank up the dehydrator and begin filling up a couple of gallon jars that house dehydrated squash and zucchini each year. Year after year I am amazed how quickly a gallon of each delicious dried veggie accumulates! Dehydrating is a simple process that is also an easy an effective way of preserving almost any kind of fruit or vegetable. For squash and zucchini the process is easy. Simply follow the directions below and then enjoy your favorite summer vegetables year round. Stop the process when vegetables become crispy. These wonderful slices of goodness can be enjoyed in a variety of ways. Put a few in a bowl or zip lock baggie and season them with your favorite seasonings and eat them as a snack. They make great veggie chips! I enjoy putting the crispy slices in soups, omelets, casseroles and many other dishes. When the crispy slices are added to dishes they will rehydrate from the moisture of the other ingredients in your dishes. For example, in soups the broth will rehydrate the veggies and bring them back to plump deliciousness. Either way…crispy or rehydrated you can’t go wrong with dehydrated vegetables. The shelf life is great as long as the container is airtight, they don’t take much shelf space, are very versatile, they’re healthy and they taste great! I hope you and your family enjoy yet another method of preserving, enjoying, and serving all of those wonderful summer squash and zucchini. As always, it’s a pleasure to hear from each of you. Feel free to share your comments, ideas, recipes and your thoughts on my posts. Don’t forget to clik follow to be notified of new posts in the future. Also, check out and enjoy my recipe of the week Tropical Squash & Pomegranate Bread/Muffins I’m sure your family will enjoy it as much as mine. As always, God bless from the mountains of Kentucky. It’s that time of year again! What time? The time to figure out what to do with the bountiful harvest of summer squash and zucchini that consumes our garden, refrigerator, counter space and even the dining room table. Even though our family enjoys both squash and zucchini…the multitude and rate at which it grows during the month of July can be a bit overwhelming, especially if you don’t know what to do with these tasty and healthy veggies. God has truly blessed our garden abundantly this year. I’m excited today to share some creative ideas of how we are preparing both squash and zucchini for our summer meals as well as filling our freezer and pantry for the winter months ahead. So grab a cup of coffee and delve into day one of our journey of preparing and processing summer squash and zucchini. What better way to kick off this series of blogs than with bread recipes! I love the smell of fresh-baked breads in the winter and just as much in summer months. Actually, I like the smell of fresh-baked breads any time of the year. But, there’s nothing quite as aromatic and satisfying as tropical squash bread baking. Yes, that’s right, squash bread. I have and enjoyed a variety of zucchini breads over the years but had never attempted squash bread until last week. As I worked around my kitchen with the abundance of both squash and zucchini that we had picked my mind raced with what to do with all of those beautiful yellow squash. With the dehydrator full of both zucchini and squash slices awaiting their fate of being vacuumed sealed for later rehydration. I began planning a new zucchini bread recipe…so why not try baking bread with squash. I am so happy that I followed through with this idea. Both breads were amazing! I hope you and your family enjoy them as much as my family does. Mix dry ingredients well and set aside. Mix remaining wet ingredients and add to the dry ingredients. Mash the banana and add to the mixture. Rough chop the pecans and add to the mixture. Don’t over mix. Wash, dry and grate one medium-sized crooked neck squash into the mixture. There’s no need to peel the squash as the peel adds wonderful flavor, color, and fiber to the bread. Don’t worry about the seeds as they will bake away as well. I use a simple hand grater to grate the squash. Once the squash has been grated give the mixture one last stir. Pre-heat oven to 350 and spray a loaf pan or you may spray a muffin tin and bake as muffins instead. Once the oven is preheated pour the mix into the loaf pan or muffin tin and bake on the bottom rack of the oven for thirty minutes. Check the bread at the thirty minute mark for doneness with a toothpick. Ovens will vary therefore check every five minutes until baked. I like my bread to have a bit of a crispy edge and moist inside…so, usually fourty minutes and my bread is done! Don’t over bake the bread. You’ll know when your bread is done by the edges, when the toothpick comes out clean, and it springs back to touch. Before you know it your kitchen will be filled with the aroma of tropical bread baking! This is a sweet delicious treat that is great served as a breakfast treat with a cold glass of milk, a hot cup of coffee or served as a dessert! Honestly, it tastes great anytime of the day or night. It’s tropical flavor dances on your tongue warm or cold. Once your bread has cooled you can freeze individual vacuum sealed slices to ensure that you have a slice of this tasty bread anytime. I have vacuum sealed pumpkin roll, zucchini bread and now tropical squash bread. When you are ready to indulge in this sweet treat simply remove from the freezer and either allow it to thaw or defrost for a couple of seconds in the microwave. The bread is amazingly still moist and just as flavorful! Pictured above are loaves of tropical squash bread and chocolate zucchini bread. I can’t wait to share the chocolate zucchini bread in upcoming days! I hope your family enjoys this delicious bread as much as mine! Please feel free to leave comments. To find out more creative and useful ways to preserve and bake both squash and zucchini click the follow button on my blog! From my kitchen to yours…Blessings from the mountains of Kentucky! It’s been a little while since I last posted. But, I have to admit…life has been a bit crazy for this farm girl/college professor/author. Between teaching two fully loaded classes this summer, which I loved, promoting book sales, and I’ll let you in a little secret…I’ve been working hard on two more books. I’m hoping to have one of the books ready for editing by fall and the other complete by winter. I’ll keep you posted as both books progress! However, the summer has consisted of more than just being connected to my laptop with students and writing. June was planting time for the Bowling’s. We finally have everything in the ground and have begun to reap the wonderful rewards of hours and hours of planting, weeding, hoeing, and nurturing. The cucumbers, zucchini and squash are growing faster than we can keep them picked. Needless to say…we’ve thoroughly enjoyed zucchini and squash sautéed, baked, zucchini noodles and also made into delicious breads. By the way, I’ll be sharing a new zucchini bread recipe very soon! I can’t believe we’re already harvesting from our garden! We just canned our first dozen spicy kosher dill pickles this week. For years we worked to perfect our kosher dill pickle recipe. We’ve developed our pickle recipe over a few years by adding, taking away and adjusting the seasoning. After several attempts, we finally perfected the recipe a couple of summers ago. I’m anxious to share our delicious pickle recipe with you so you can enjoy these quick and easy spicy kosher pickles with your family. Canning pickles requires a little prep work and a few ingredients. bring to a rolling boil and add 3 cups of white distilled vinegar and turn heat off. Pour or dip mixture into jars over the sliced cucumbers and I like to add 1/4 teaspoon of pickle crisp to each jar for an added crispness to the pickles. Be sure to leave head space for the processing of the pickles, wipe the rim of the jars, add the flat and ring. Seal the jar but don’t tighten extremely tight. Place the jars in the canner, cover with water at least an inch above the jars and put the lid on. I like to use a stove top canner. I’m a creature of habit and have always canned with a boiling water bath. I’ve found it to be successful. So, I find no reason to mess with success. Set temperature to medium high so the jars don’t heat up too fast. Bring the water to a rolling boil. Once the water begins to boil set your timer for fifteen minutes. After fifteen minutes turn the stove off and allow jars to sit for five minutes. Carefully remove the jars from the water with jar lifters (which are the handiest inexpensive tool you’ll ever invest in) carefully place the jars on a towel to protect the surface beneath them. Don’t allow the jars to touch. Soon you’ll hear the POP that I never grow tired of hearing. That sound means the pickles are sealing! They should all seal within the hour. Once the jars and lids are cool to the touch write the date on the lid with permanent marker. Allow jars to cool completely before storing away in the pantry. I hope you and your family enjoy our spicy kosher pickles as much as my family, friends neighbors do. We’ve found them to be a tasty addition to burgers, hotdogs, soup beans, and actually as a side to most of our meals. Please feel free to leave feedback. I always look forward to reading your comments. Feel free to check back for upcoming summer canning ideas and more about my new books, life as a college professor, and more of my adventures of living in the Appalachian Mountains. If you notice there’s a jar of squash that’s visible in the picture above. I’ll be sharing this recipe with you soon. Wishing you and your family the best from the mountains of Kentucky! Elk captured on our son, Jonathan Bowling’s, trail camera behind our house. @copyright Healthier Me Simple and Clean. Many people believe that beauty is in the eye of the beholder. I have been overheard many times making this statement when referring to the beauty of the Appalachian Mountains. I am also a believer that not only is beauty found within the eye of the beholder, but also that success lies within the desire of the believer. Recently I read an article about life in the Appalachian Mountains that lingered in my thoughts, with a mix of emotions hovering over and within me. Life in Appalachia was portrayed with gloom and despair, thus leaving the reader with a feeling of hopelessness. The article implied that people who were born into poverty didn’t have a choice to live otherwise. The picture that was painted was a stereotypical view of Appalachia that many have and continue to exploit to gain popularity whether it be an audience for their blog, for social media publicity, money, or their name in lights. What the author of this very derogatory article neglected to divulge were the joys of growing up in the Appalachian Mountains. Over the years authors, filmmakers, and actors in Hollywood have profited through exploitation of Appalachia choosing to focus on what small towns “don’t” have. Films have been made with careful selection of the poorest part of towns carefully and intentionally divulging only dilapidated buildings, rather than new structures, or renovated buildings that houses independent thriving businesses. Many times the focus is often on poor housing in small towns rather than homes that proudly stand boasting beautiful manicured lawns, hardy vegetable gardens, luscious rolling green mountains, blooming flowers, and carefully trimmed hedges and trees. When the media chooses to focus on the negative aspects, or poverty, which by the way exists in all towns whether they’re large or small…the reader is left with a gloomy feeling of sorrow, despair and almost a feeling of doom. Appalachian people are often-times portrayed as being illiterate, undereducated, and ignorant people who are less fortunate than those living elsewhere. Manchester, located in Clay County, is a small town in Appalachia where I grew up, raised my family, and still reside today has been recently been accused of being one of the hardest places to grow up in the United States, as well as being a community where citizens are expected to have a shorter lifespan than those living elsewhere. I find both of these statements to be misleading, offensive, and also stereotypical. I find myself smiling when I reflect on my childhood. I don’t recall life being a hardship, doom, gloomy, unhappy time in my life. Today, I enjoy sharing my memories of growing up in Kentucky through stories, both oral and written. My memories are filled with fun escapades of playing outside, working in the garden, helping can fruits and vegetables, listening to countless stories told to me by my grandparents, afternoons sitting in the shade with family just enjoying the serenity of the mountains, playing with cousins, enjoying wonderful cooked meals from the vegetables that we raised, and learning wonderful skills from my mother and grandmother. We didn’t live within city limits, and still do not. We were raised in a rural community that enjoyed farming. My grandparents had a small store that was often referred to as the heart of our little community. Many of my family members still reside in this same neighborhood. I was raised to know that I had choices, and also to believe that I could be anything that I wanted to be. I was encouraged to always try to better myself by reading, learning, working hard, and also by believing in myself. I was raised in one of the poorest parts of the state of Kentucky. What? We grew up poor! No one told me that! I wasn’t aware that we grew up in a poverty-stricken area. No, again, I was raised to dream and dream big! I could be anything that I wanted to be. I could be a mother, I could be a Christian, I could be a teacher, I could be an author, I could be whatever I chose to be! I was taught good moral values, about Jesus, how to work the land to feed my family, how to always believe in myself, to be proud of my heritage, to have a plan for my future, and if I got knocked down…get back up! Instead of profiting from negative doom, gloom, and despair…I prefer to divulge the wonders of the Appalachian Mountains, the joys, the beauty, the opportunities, growth, success, and the wonderful mountains that I am proud to call home. Again, I was never told that we were poor, or that we lived in an impoverished area, and never told that I couldn’t better myself. As a public school teacher, I always passed this same advice to my students. I always encouraged my students year after year that they could be anything that they wanted to be, to reach for the stars, to believe in themselves as I too believed in them. Today, as a college professor, I am still relaying that same positive message. Many might say that small Appalachian towns have nothing to offer. I disagree. So, what does our small county of Clay have to offer? The beauty of the mountains, rich farm soil, beautiful pastures for livestock to graze, farm fresh eggs, distinguished schools, top-rated teachers, private Christian schools, a multitude of welcoming churches, book clubs, a well stocked public library, quilting clubs, pumpkin patches, ATV rides, elk hunts, successful local authors, artists, parks, employment at the federal prison, kayaking, fishing, local shopping, home cooked meals at locally owned restaurants, farmers’ markets, Main Street markets, grass-fed beef, fresh venison, beautiful walking trails, beautiful homes, friendly people, smiles, and a welcoming environment. One valuable opportunity that goes unmentioned in many articles about our small town of Manchester is the opportunity to complete a college degree at Eastern Kentucky University, which is located within city limits. These are only a few things that residents and visitors have to enjoy. Again, beauty lies within the eye of the beholder, happiness with the heart of the dreamer, and success within the heart and desire of the believer.